Hybrid Tea Roses are not hardy and require substantial care and winter protection to survive in the North and much of the Midwest. However it may not be as much work as you think, many gardeners have found great success growing them even in the cold climates. Check the previous pages about growing, pruning and winter protecting these roses. If you are tempted to try these long stemmed beauties, here a some of the best to consider.. and yes, they are tempting aren’t they? ‘Artistry’ is a repeat flowering rose, blooming fairly continuously in flushes through the season on new wood. The buds are pointed and ovoid. Producing primarily one bloom per stem, the flower is gorgeous in coral orange with a paler coral reverse. It is quite similar to ‘Tropicana’, but with slightly larger blooms and the color holds up slightly better than ’Tropicana’. ‘Artistry’ is very heat tolerant and prefers a warm site in full sun. Be sure to prune ‘Artistry’ early to promote new growth as it blooms on new wood. The plant is healthy and grows vigorously. This is a good container rose, be sure to protect from freezing whether in the ground or in a container. ‘Artistry’ is wonderful in mass plantings or as an accent plant. The cardinal red high centered blooms of ‘Forgotten Dreams’ produce an exceptionally strong old rose fragrance. The blooms are striking but does not always repeat well. Generally repeat will be from late spring to summer. It seems to be somewhat particular about planting site and conditions as some gardeners report that a moved plant became more vigorous with excellent blooming throughout the season. But the luxurious red blooms and wonderful fragrance may be worth forfeiting some blooming. The plant is hardy and grows vigorously, and is quite heat resistant. A good choice for colder regions if protected and serves as an excellent specimen plant or accent. Unique coloring is displayed in the blooms of ‘Glowing Peace’. The petals are saturated with rich shades of amber yellow, golden melon and edged in sunset reds. The blooms often open in golden yellows and as they mature will develop more and more blushes of orange and reds. Blooming repeats in moderately abundant flushes. This Meilland bred rose will do very well in hot climates but tough enough for northern regions with proper protection. ‘Glowing Peace’ is a good choice for containers as well as garden beds, and excellent for cutting. As a matter of fact they are quite stunning in arrangements alone, or work very nicely with a variety of other rose colors. Long pointed buds open to huge blooms of intense shades of clear pink. ‘Marijke Koopman’ blooms are of classic tea rose form and exhibition quality, borne singly on long stems. The shrub is upright and dense with a spreading habit and is pretty tolerant of urban pollution, so a good choice for urban and inner city environments. Also will do very well in cool and coastal regions. 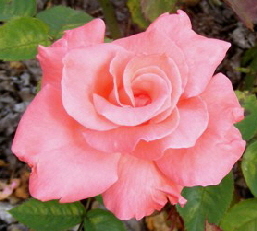 ‘Marijke Koopman’ is vigorous and disease free, one of the easiest tea roses to grow. It will tolerate less than ideal soil and weather conditions, and a bit of shade. In hot regions it may not perform as well and the bloom color and quality may suffer. A stunning cut flower. ‘Memorial Day’ produces unbelievably full blooms in perfect old fashioned form. Pointed ovoid buds spiral open to enormous blooms. The color is stunning orchid pink blushed with lavender tones. Powerful damask rose fragrance will perfume an entire room in a vase. The long stems bears its’ thorns low. The plant performs exceptionally well in the heat of summer, the bloom color will deepen in autumn. ‘Memorial Day’ holds up exceptionally well in summer heat. But with proper winter protection vigorous and disease resistant rose will do very well in northern regions. ‘Rina Hugo’ displays gorgeous deep magenta pink classic double blooms, repeating all season. The elegant flowers are very large on long stems, and the color holds very well all season. Buds are pointed ovoid. The plant is strong and vigorous, with full foliage. 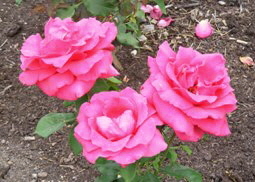 ‘Rina Hugo’ is pretty hardy for a tea rose and should do quite well even in zone 6, although protection might be advised. This would be a good selection if you want to grow hybrid tea roses in the north, of course fully protect from winter. But ‘Rina Hugo’ will do best where the nights are warm, and loves full sun. It is an easy tea rose to grow and care for. This is an excellent specimen rose great for beds, border gardens and cut flowers. Bloom Season: Repeating flushes throughout the season. High centered fully double blooms are a creamy pink that show hints of gold at the base of the petals and are blushed and edged with a deeper pink. ‘Secret’s’ blooms are borne primarily as singles, with occasional small clusters. Prolific flushes of blooms from early summer to fall will perfume your gardens all season. Thorns are minimal on this rose plant. ‘Secret’ is a superior performer that is hardy and vigorous, putting up with poor weather conditions in the north. Just an interesting note, ‘Secret’ produced a sport named ‘Secret’s Out’ that is identical except pure white. Award winning ‘Tahitian Sunset’ presents huge spicy colored blooms of classic form on tall stems. A beautiful blend of peach, apricot-pink and yellow is warm like a tropical sunset. High centered buds open to very large full blooms, repeating all season. Remove spent blooms to encourage rebloom. ‘Tahitian Sunset’ is heat tolerant and like all day sun, but will do very well if protected in northern regions. Sturdy upright foliage is well balanced and remains fresh all summer. With a strong anise scent, you will want ‘Tahitian Sunset’ where you can appreciate the fragrance as well as the gorgeous flowers. And you will want to cut some for a fragrant arrangement inside too. Disease Resistance: Good disease resistance, somewhat susceptible to powdery mildew. ‘Tiffany’ produces very large exhibition roses in classic tea form. The buds are quite lovely, displaying the golden centers at the base of the unopened petals. Blooms are produced in abundance continuously throughout the season. A strong fruity fragrance will perfume your garden, and the amazing number of blooms will leave plenty for cutting. Be sure to keep cutting the long lasting flowers for vases to encourage continued blooming. ‘Tiffany’ grows tall and vigorously. In cooler regions take preventive measures to prevent powdery mildew. But overall this is a good performer in cool and northern regions if properly protected from winter. A well established plant allowed to grow large with minimal pruning will produce a stronger, more resistant ‘Tiffany’. 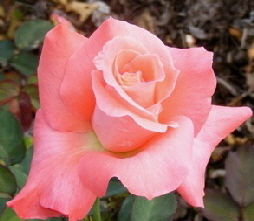 ‘Touch of Class’ is rated the finest hybrid tea rose in the world by the American Rose Society. The perfect buds open slowly to expose the most perfect rose bloom you will ever see. The coral pink petals have a creamy reverse, are slightly ruffled and reflexed. The best coloring is produced in moderate temperatures. The foliage is a healthy and vigorous deep green with mahogany red new foliage. Despite being the queen of the roses, ‘Touch of Class’ is a great garden rose. Consistent flowering with large double blooms and gorgeous color is just what you want in your garden or as an accent plant. Not to mention the excellent, long lasting cut flowers it will supply.